Organizations and municipalities work to save land for a variety of reasons. Whether the interest is in preserving farmland or forested parcels, the goal is to prevent permanent conversion of land to other less sustainable uses, such as residential development and commercial sprawl. Land trusts and other non-governmental organizations involved in land protection often find themselves in the process of fundraising and deal-making to secure funding for land protection. In some cases, whether through a donation or an outright purchase, the organization finds themselves owning the protected land. As all homeowners know, owning property brings with it responsibilities and inevitable expenses. The conservation organization may find itself owning land and not have the resources to devote to stewardship of the property after it is protected. 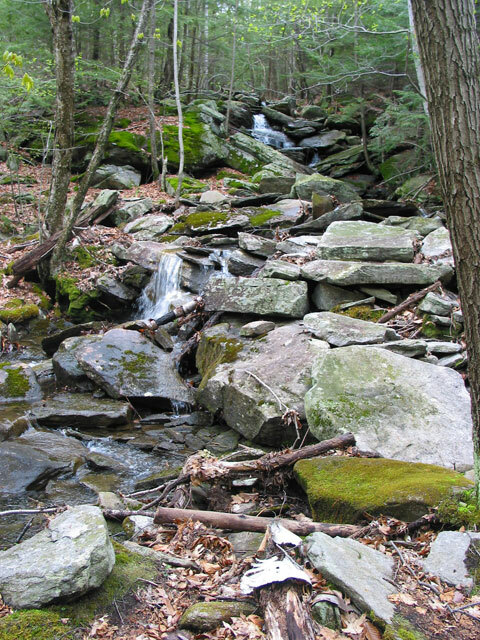 Mount Grace Land Conservation Trust (MGLCT) in Athol, Massachusetts considers the stewardship of their protected lands an important component of their mission. When appropriate, forest management plans are in place and improvement thinnings and timber harvests occur to improve the health and condition of the forest. The added benefit of forest management is the potential of timber sales as a revenue stream for the organization. 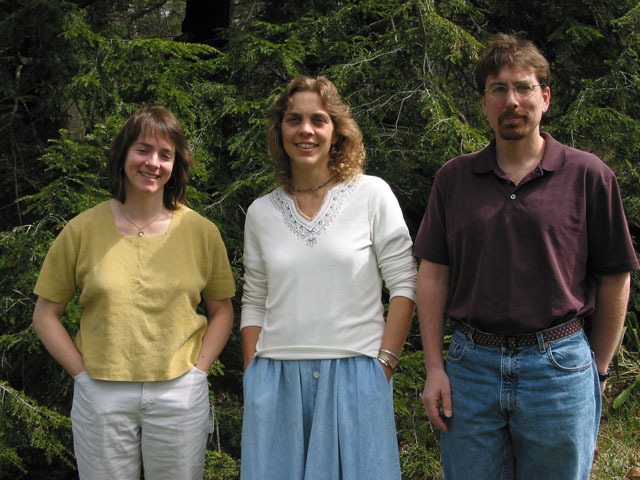 The case presented will explore MGLCT’s history as a conservation organization believing in stewardship and forest management, and how that vision affects organizational resources and community relations. 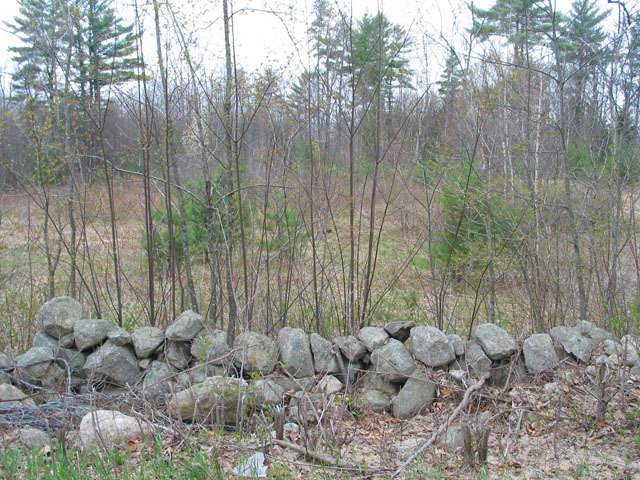 It will also give examples of their conservation strategy on the two properties, Hidden Valley Memorial Forest in Wendell, Massachusetts and Skyfields Arboretum in Athol, Massachusetts. 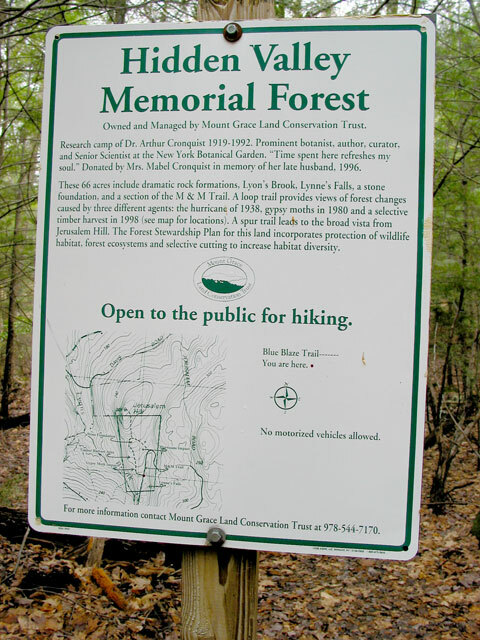 Mount Grace Land Conservation Trust was founded in1986 by small group of citizens and land use professionals concerned about the disorganized and rapid conversion of forest and farmland in north central and western Massachusetts. 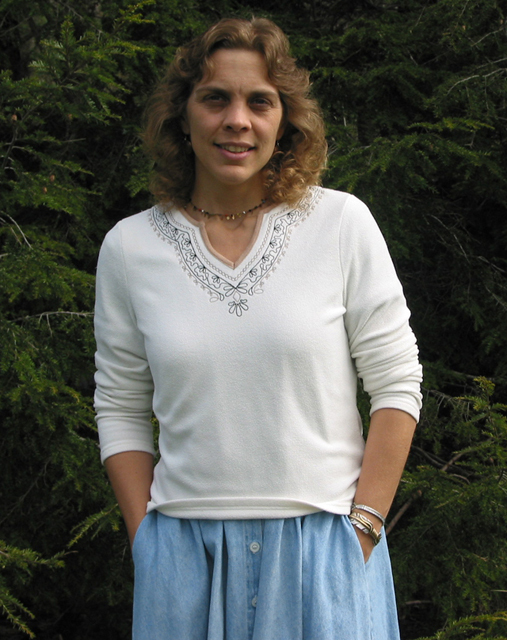 Mount Grace’s work is concentrated primarily in a 23 town area. After nearly 20 years, the staff and Board of Directors have saved almost 19,000 acres from development. Today, MGLCT has a staff of three full time and two part-time employees. While land protection is the mission of the organization, the ongoing stewardship of their properties is a guiding principle. Like other small organizations, Mount Grace is trying to protect the maximum amount of land with very limited financial resources. Currently, MGLCT retains ownership of 26 parcels or 1374 acres of land as an organization and actively manages 18 parcels or 910 acres. Adding the stewardship consideration to land protection deals creates additional challenges for the business of land protection, but offers a number of rewards as well. Speaking to the staff at MGLCT, it is clear that stewardship makes sense not only for the organization, but also the communities it serves. This, perhaps, is the secret to Mount Grace’s success. Leigh Youngblood, executive director of MGLCT, explained that the current trend in conservation is to fold stewardship into land protection deals, but this has been an important part of Mount Grace’s strategy from the beginning. When considering a parcel of land for protection, the staff considers who might be the best steward of the property. Generally, land ownership passes to another entity while Mount Grace may hold the conservation restriction. Occasionally Mount Grace believes that it should steward the parcel itself. In these cases, it has purchased land with funds leftover from other projects or has accepted land as a donation. Owning land, however, brings with it a host of responsibilities and costs. Some parcels require trail work and maintenance. Staff time must be spent to visit land and monitor conservation restrictions or check for unwelcome use. Mount Grace keeps their properties on the tax roles, even though they are exempt as a non-profit organization. To help control this expense, the properties are enrolled in Massachusetts' current use tax program, known as Chapter 61. Although an added expense for a small organization with a limited budget, keeping their properties on municipal tax roles is very beneficial for community relations. Youngblood explains that her interest is not only in protecting the land, but maintaining or improving its condition. She frequently asks herself if the parcel itself can pay for any of its care. 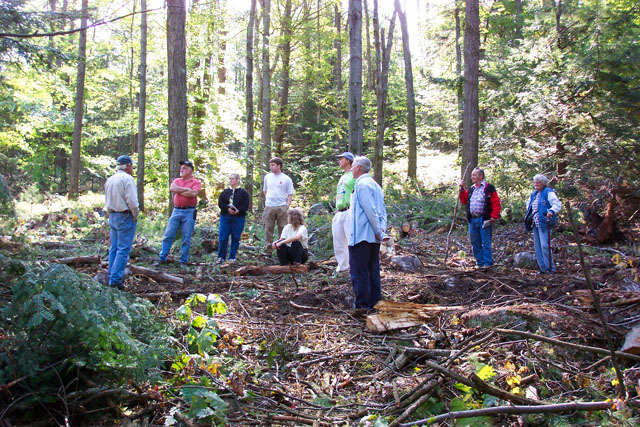 The answer, much of the time, is “yes.” Forest management for timber is an important way for a land trust not only to protect and improve conservation land, but also to obtain some revenue to offset the costs of ownership. By managing 2/3 of their protected acres for timber, the organization can own some property, improve its condition and hopefully offset some of the costs of active management through income from timber sales. Conservation organizations frequently find themselves up against community politics when considering forest management on protected land. Many people today feel very strongly that cutting trees is wrong, no matter the circumstances. There are even doubts among Mount Grace’s constituents, including Board members. Youngblood describes the organization as “a neighborhood land trust”. This perspective is the key to their successful land management. Keith Ross, a founding member of the organization, is a forester, and he brought this expertise with him to shape Mount Grace’s philosophy. Beyond that, Youngblood explains, Mount Grace has always recognized the community’s support for traditional forest uses – hunting, fishing and timber harvesting – and the importance of an open space economy to north central and western Massachusetts. Part of their success as a land trust, Youngblood believes, is that Mount Grace reflects the culture and communities in which it works. Furthermore, MGLCT has managed and unmanaged lands in their land base. Youngblood reiterates that when they make a decision about stewarding a property, they do consider what is best for that parcel. Since the primary mission is land protection, they are not compelled to manage every acre. Because of this balance of managed and unmanaged land, Mount Grace is in a unique position to be “all things to all people”. Since land management is a known quantity at Mount Grace, when a harvest is scheduled it is viewed as an opportunity for education and discussion. Alain Peteroy, the organization’s stewardship coordinator, adds that the land that Mount Grace manages is managed well, and this helps public relations. Glenn Freden is the organization’s consulting forester and has written forest management plans for several of the parcels. Peteroy explains that frequently Freden donates his time on weekends to lead a walk at an area either pre-, during, or post-harvest. These are open to the public and give Freden an opportunity to provide a silvicultural explanation for management activities and keep discussions of forest management out in the open—avoiding the impression that Mount Grace is “ashamed” of the practice. Freden also gives seminars on integrating timber and wildlife goals on Mount Grace properties, which help the public understand that cutting trees can accomplish a myriad of objectives. Open discussion with scientific backup, Peteroy says, is often enough to assuage any doubts in the community. Some people may never approve of timber harvesting, and that is okay with Youngblood. She plans to continue managing Mount Grace’s forests and harvest timber when prescribed. She explains that, while timber income is a plus, it is important to her to encourage good stewardship by modeling good stewardship. These are only 2 of the parcels that MGLCT has protected and where harvest activities have occurred. Both properties came to Mount Grace as donations, but as properties accessible to the public, require more ongoing upkeep than some of their more remote areas. 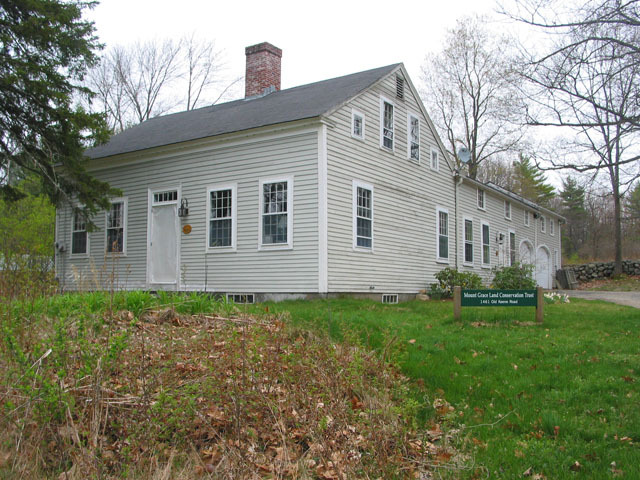 Mabel Cronquist, the widow of world-renowned botanist Arthur Cronquist, approached Mount Grace in 1994 to help protect 66 acres of forest in Wendell, Massachusetts. The Cronquist family had camped and examined the native flora on this property for over 20 years. 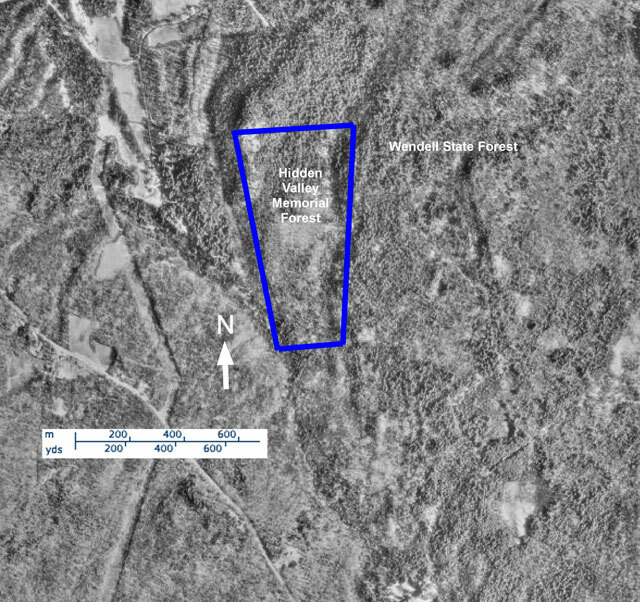 Because the property abuts the Wendell State Forest on three sides, Mount Grace had planned a sale of this land to Massachusetts Division Forests and Parks. Youngblood saw the potential in this property, however. The M&M Trail runs through the property, and there is a beautiful waterfall, named Lynne’s Falls after the Cronquist’s daughter. 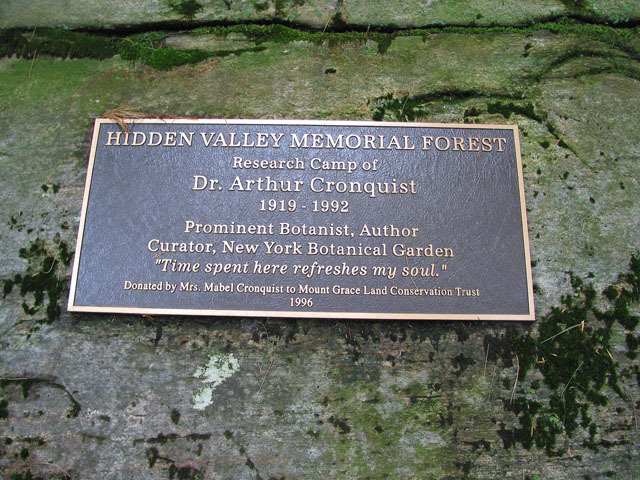 Also, Youngblood knew the property would attract botanists and other naturalists familiar with Arthur Cronquist’s legacy. Interested in retaining the property for Mount Grace, Youngblood traveled to White Plains, New York to ask Mrs. Cronquist if she would consider donating the property to the organization. Before she had a chance to ask, Mrs. Cronquist offered the property to MGLCT if they put a memorial to husband on the land. Youngblood was happy to accept, and Mrs. Cronquist sold the property, which became the Hidden Valley Memorial Forest, to MGLCT for $1. Youngblood had a forest management plan created for the property which focused on timber management, wildlife habitat, and biodiversity. The first harvest occurred in 1998. The timber sale was $5,500. Mount Grace installed a bronze plaque on the site telling the story of Arthur Cronquist. 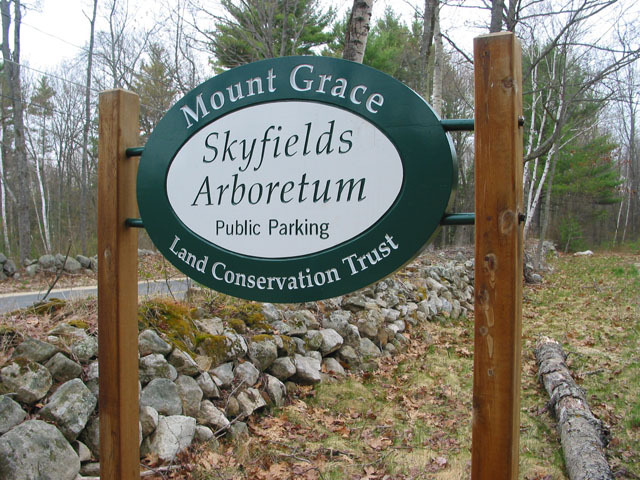 Skyfields Arboretum is located in Athol, Massachusetts and is currently the site of MGLCT’s offices. Margaret Power-Biggs, widow of the famous organist E. Power-Biggs, approached Mount Grace in 1998, hoping that the organization would be interested in protecting the 40 acres of field and forest surrounding her home. Her wish was to create a natural landscape arboretum that featured native plants. She hoped the land would become a place for learning about and studying nature and for quiet contemplation for residents of the area. Of course, Mount Grace was very interested in this special piece of property. With 2 open fields and historic stone walls as well as forest, it offered a diversity of landscapes in a small area. Mrs. Biggs made arrangements to donate her land and house to MGLCT. She also donated a conservation restriction on the property to the Millers Rivers Watershed council, another local conservation organization. Mrs. Biggs was interested in Mount Grace’s plan to manage the property. So much so that before her death she had a forest management plan created and donated the revenue from the first timber sale in 1998 to Mount Grace – nearly $11,000. The property came to Mount Grace upon Mrs. Biggs’ death in 1999. Staff set about the task of creating the arboretum, which was professionally designed by Walter Cudnohufsky Associates, Inc. in Ashfield, Massachusetts. Much landscaping and planting had to be done in the fields, trails needed to be cleared, and a parking lot was carved out of an area near the road to welcome visitors. Volunteers helped with many of these tasks, and additional funding was obtained through various grant programs. The revenue from the original timber sale did not go very far. Youngblood points out that this is Mount Grace’s most highly managed property. It requires continuous maintenance and landscaping as well as biennial mowing of one field for habitat diversity. Much of the budget for this property is spent on stewardship activities, so any revenue stream would be helpful. These two properties are only a snapshot of MGLCT’s ownerships. Although they came to Mount Grace as donations, stewardship of the land requires ongoing funding for trail maintenance, printing of trail maps and educational materials, taxes, landscaping, forest management plans – a long list for an organization with a limited budget. Although grants and gifts can help offset some of these costs, Youngblood expresses a desire to have a more reliable funding source. In addition to harvests on these two properties, MGLCT has had 8 additional timber sales from their managed land since 1999. The combined revenue from these sales totals nearly $30,000. This revenue, which they otherwise would have had to raise through fundraising, has been a helpful addition to the budget. But managing a few sites for timber does not make it a reliable revenue stream. Youngblood explained that the annual operating budget of Mount Grace is approximately $250,000. Timber income does appear as a line item in their budget, but in two of the last four years they have not had a timber sale. Harvests depend on weather, growth cycles, scheduling of work and other factors, and Mount Grace has learned not to count on it. When timber sales do come in, they are an added benefit that helps offset the cost of careful land stewardship, and the money stretches the land trust’s limited resources. Youngblood says she is very interested in adding more property to Mount Grace’s land base in order to have a more reliable flow of revenue from timber sales. The conservation community refers to forests managed sustainably for timber by land protection organizations as a “living endowment”; they are renewable resource that, when managed wisely, can provide an increasingly valuable financial base to help sustain their organizations. For this reason, Youngblood recommends an active management approach to other conservation organizations. For those considering it, a parcel by parcel approach may make sense. 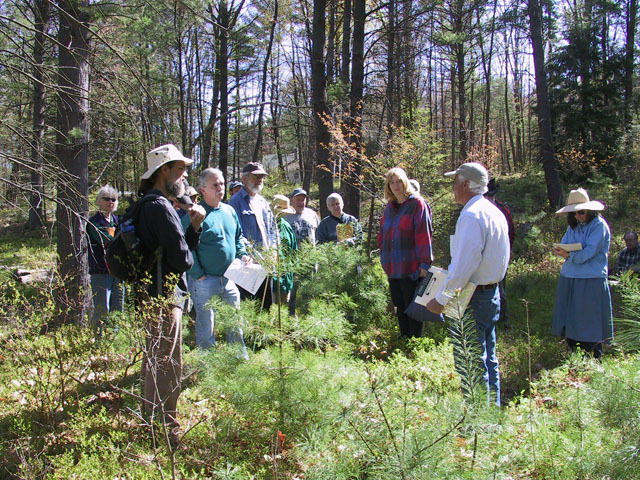 By choosing one parcel and developing a forest management plan, an organization has the opportunity to engage the community and their constituents in the stewardship process. This experimental approach can help organizations assess whether or not forest management would work for them without committing their entire land base to a new management philosophy. While it is clear that Mount Grace has a progressive approach to land protection, they are still exploring and evaluating forest management as a means to sustain not only the forest, but also their organization. For MGLCT, land protection does not end with the sale or conservation restriction, but continues with ongoing stewardship. By engaging in stewardship activities, conservation organizations have the potential to do much more than save land. They can create a reliable and renewable revenue source for their operations, educate the public about stewardship through example, and contribute to a locally-based, working forest economy. 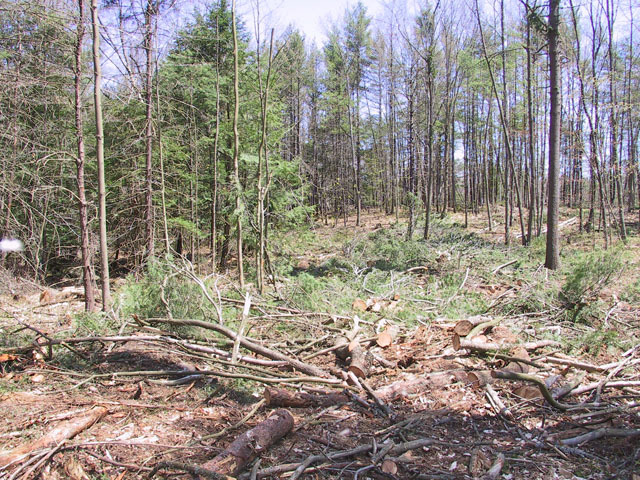 More work needs to be done to determine how large a land base is necessary to provide for an annual timber sale to supplement Mount Grace’s budget, and different organizations will have different needs. 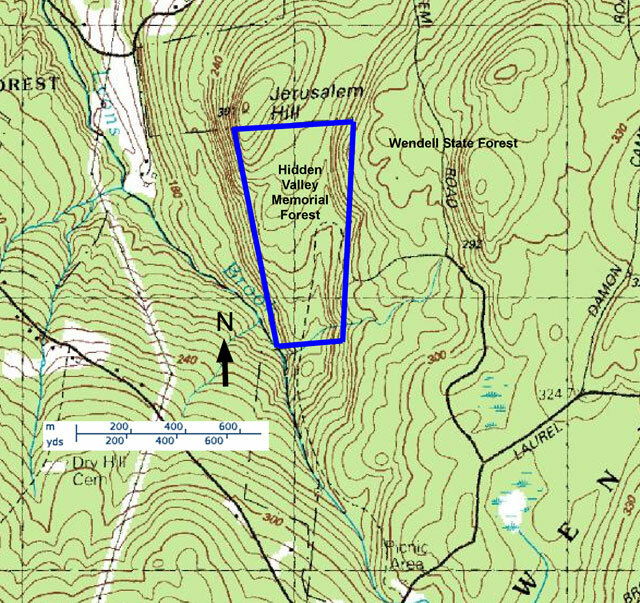 However, further analysis of conservation work on Mount Grace’s lands may provide a persuasive argument for other land trusts to follow their lead and fold land stewardship into their missions of land protection. It is important to consider what will happen to land after it is protected. Stewardship activities cost money and staff time. It is important to identify ways that land can help pay for the costs of stewardship. Look to the communities served by your organization when assessing the possibility of forest management activities. Does it fit with their culture and philosophies? Managing for timber can create a reliable and renewable revenue source for conservation organizations, educate the public about stewardship through example, and contribute to a locally-based, working forest economy. Forest management activities should be opportunities to educate and engage the public. Avoid the appearance that it is something to hide. The best way to encourage good stewardship is to practice good stewardship. Some people will never approve of cutting trees and that is okay. Organizations interested in managing for timber can start small and develop a forest management plan for one parcel. This creates an opportunity for discussion between the organization and its constituents and avoids an abrupt change in organizational philosophy. 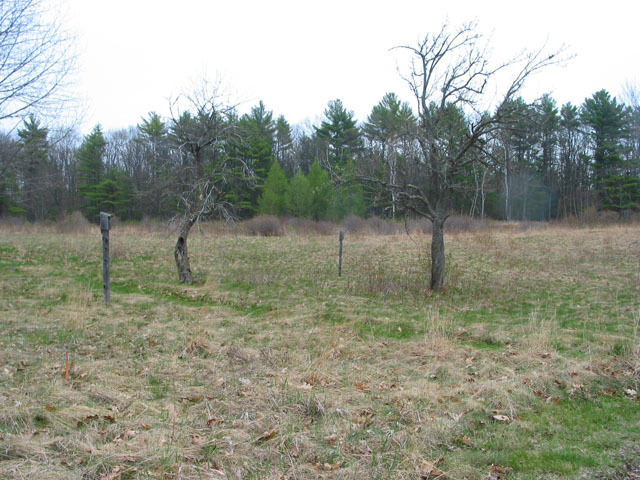 Mabel Cronquist contacts MGLCT through her Massachusetts realtor about the possibility of protecting 66 acres in Wendell, Massachusetts. The first Purchase and Sale Agreement on the Cronquist property is signed. The contract is contingent on the state purchasing the property from MGLCT. Correction of a title defect then delayed the project for over a year. 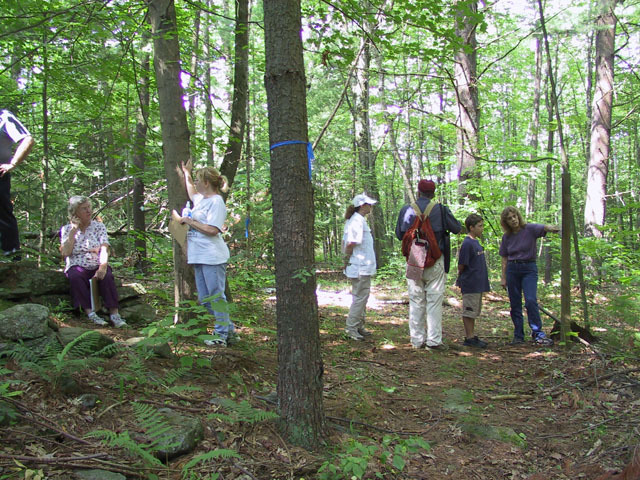 State officials from Massachusetts Forests and Parks visit the property. Leigh Youngblood visits Mabel Cronquist to discuss a possible donation of the land to MGLCT. Before she has the opportunity to ask, Mrs. Cronquist offers to donate the land in memory of her late husband, botanist Arthur Cronquist. The Purchase and Sale Agreement is amended to eliminate the agreed sale price of $26,000. The deed to Mount Grace reads for $1. A forest management plan is created for Hidden Valley Memorial Forest. It focuses on timber management, wildlife habitat, and biodiversity. Mount Grace sells the timber from the first harvest at Hidden Valley Memorial Forest for $5,500. Margaret Biggs contacts MGLCT about donating her Athol home along with 40 acres of fields and forest to the organization. Mrs. Biggs, interested in the idea of forest management, has a forest management plan created for her property. She intends to donate the money from the first timber sale to MGLCT. MGLCT accepts a donation of $11,000 from the Mrs. Biggs. The money came from the sale of timber on her Athol property. Mrs. Biggs passes away, leaving the property to MGLCT. 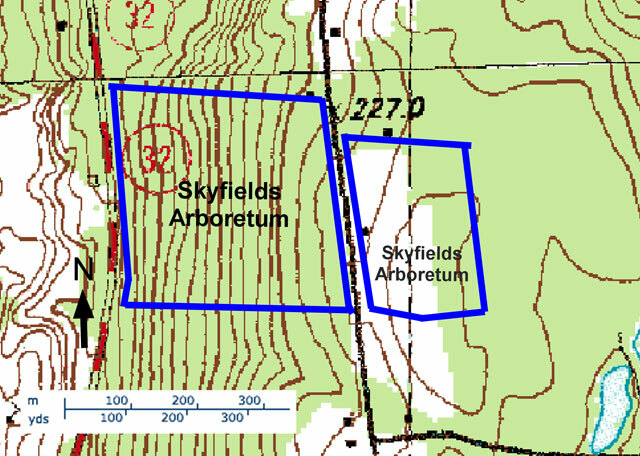 The organization takes over stewardship activities on the property, including the creation of Skyfields Arboretum. MGLCT moves its offices to the house on the Biggs Property and begins planning the arboretum with Walter Cudnohufsky Associates, Inc.
Skyfields Arboretum plan is complete and the property is open to the public. 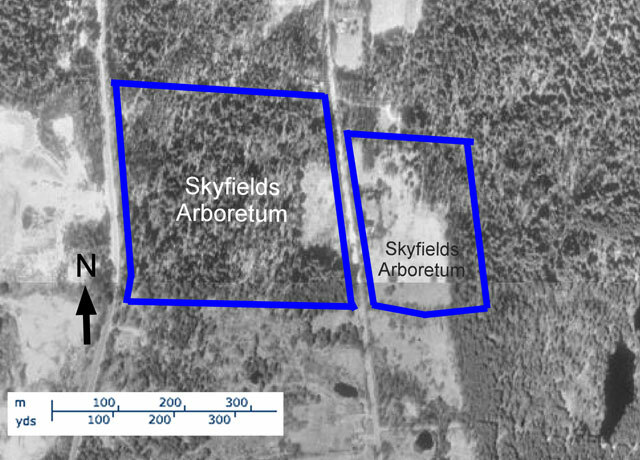 Millers River Watershed Council holds the conservation restriction on Skyfields Arboretum.